Saturday- I worked today with Patricia. I was supposed to be off, but had changed days with Polly so that I could have two days off in a row, earlier in the week.. I am exhausted. It has been a very rough month at work. Originally, we were leaving to go to Quartzite to the big RV rally and stay with the Roadrunners. Our group was not going, and we discussed going and decided not to this year. We know that we would spend more money and I am so tired, it was easier to just stay in Sun City. It was a busy morning, but by the afternoon, things had quieted down. Patricia even left early as she was not feeling well. Bob worked on the cabinets and doors. We ate dinner at home and I fell asleep in the recliner. Sunday- Wow, I am not used to being off on a Sunday! We ran to Costco at 10 AM, getting gas ($1.67 gal) then doing some shopping. We stopped at Target and Walmart and grabbed some burgers at In-in-Out for lunch. We had a nice nap, then started cooking for the Alfa Pot Luck dinner. Bob had run around inviting all the folks in the park who have Alfa’s to the Pot Luck yesterday. Earlier in the week I had reserved the game room. We started the Pot Luck at 5. Almost everyone showed up. We had hoped for 13 people, but ended up with 11. One guy is alone and I guess he felt funny coming alone. Another gentleman showed up alone, as his wife was not feeling well. He did not eat anything and left when we started to eat. At 5:15, some guy showed up to start setting up for poker. At 6:10, some guy from the Cribbage group showed up and asked us to leave since he has the room. We explained to him that we also have the room, but we did start cleaning up as everyone had eaten everything except desert. The activity people have been having issues with the rooms. Everyone seems to think they have reserved the entire room, when all they have reserved is a couple of tables. They are re-doing the system and we had signed up and had a ‘purple’ sheet, granting us permission to use the room. We explained to this guy that we had permission and had signed a purple sheet. He kind of looked like a fish out of water, but we were not budging. The week I was sick, MaryAnne had a problem with Mahjongg on the Tuesday morning, as there is a writers group that also uses the game room. They are new and think they have the whole room. MaryAnne had gone to the Activity office and spoke with them and signed a purple sheet. We have been on the schedule for the room, from last year. You sign up before the season is over the previous year. Anyway, we set up and played Mexican Train until 10:30, having a great time! Monday- I left Bob doing laundry as it is sheet day, and I headed over to Macy’s. I bought a new bathing suit, a new top sheet for the bed, and two tops on clearance. Since I could not find everything I needed at Macy’s I went to Kohl’s, where I found the rest of the items I needed. I tried to go to the Chiropractor, but there was a line, so I called Bob to see if he wanted me to pick up lunch. He did, so I went to Paradise Bakery and Café and picked up half sandwiches for both of us. I returned home and we did some items around the MH. It was nice outside so we sat out and read our books until it became too cool and we moved inside. I promptly took a short nap in the recliner. We cooked dinner, watched TV and went to bed. Tuesday- We had extended Mahjongg hours to from 9-12 starting today. We have a purple sheet giving us the tables in the room. I arrived a little early to find one of the gals, Laura, in the hallway. She said that she was told that we could not use the room, by one of the gals from the writers group. I said no, and went into the room, with Laura trailing behind, and we started setting up for Mahjongg. Other gals arrived and we started to play. We tried to be very quiet, but the writers group did not. They were extra noisy. At a little before 10, our table laughed and the cat fight started. We were informed that the writers had the room and that we should leave as we were disturbing them. . We told them that we also have the room and that we are not leaving. They kept saying that they were going to report us to Activities’ and we said go ahead, since we are on the scheduled and have a purple sheet. There was a a lot of back and forth when MaryAnne finally stood up and okay ladies, lets be good neighbors and stop this. Everyone went quiet and we continued to play. At 10, a second table of Mahjongg players arrived and we continued to play. The writers, who are supposed to leave at 10:30, left at 11 after muttering that they were going to change rooms. They decided that instead of being in the ‘game room” they would move to the coffee house. Okay, makes much more sense, as there are only about 6 of them. But we suspect they are not going to bother to go to Activities and sign up for the room. There is an article going to be in the park newsletter about all the room reservation system in February. I returned to the MH at 12 and we went to lunch at Denny’s. Bob had wanted a club sandwich. This was not the Waldorf Denny’s and is the first time in years that we have been to a Denny’s. The food and service were great. The price was good and you can also get 15% off the total bill with your AARP card. NICE! We returned home and laid down and took a nice long nap.. The bark alarms went off at about 3 PM when Bea, the lady who runs the card making group, knocked on the door. Bob ran to the door and she gave him two card packets that I had paid for. Linda and I had both missed the card making class last week and Bea was dropping off the packets we had purchased. We sat outside enjoying the nice weather, with 78 degrees and blue skies. We ate an early dinner, then went to the Sunrise Mountain Library (SML) for an author meet and greet. . The library is actually in Peoria AZ. When Del Webb built Sun City, there was a trailer park already in place. It is more of a mobile home park and is located behind our RV resort. There is a big difference between a mobile home park and an RV park. Del Webb did not want the ‘trailer park’ in his city, so he had the town lines redrawn. We are actually across the street from Sun City, located in Peoria, right on the border of Surprise. If you look at a county map, you would see the towns rambling all over the place. This also means that we cannot use the Sun City senior center or any of the Sun City facilities. We have to use Peoria, as our street address is Peoria, instead of Sun City. Our mailing address is Sun City, go figure! It is interesting if you stay here. Anyway, this is the library that we use. The author was Mark Sullivan. While you may not have heard of him, he has a number of his own books, but he is also is a co-writer with James Patterson, one of our favorite authors. The session was to start at 6:30. We arrived early and went to pick up some JA Jance books, as she is coming in March. Some of our friends read JA Jance, so we wanted to give her a try. At 6:35, Mark had not arrived. It turns out he went to the main Peoria Library. The authors are sponsored by The Poisoned Pen book store in Scotsdale. The guy from the Poisoned Pen introduced himself and told us Mark was on his way. He also told us about the bookstore. The reason that the SML branch gets the authors to come is that this guy used to work at the SML and when he has authors in town for a few days he gets them to visit Peoria. The Poisoned Pen is a small bookstore, but 72% of their business is online, internationally. If you ever want an autographed book, this where to purchase one, online, as most of the famous authors visit there. They have a lot of interesting author coming to Phoenix, although not necessarily to SML. Mark arrived and it was very interesting. 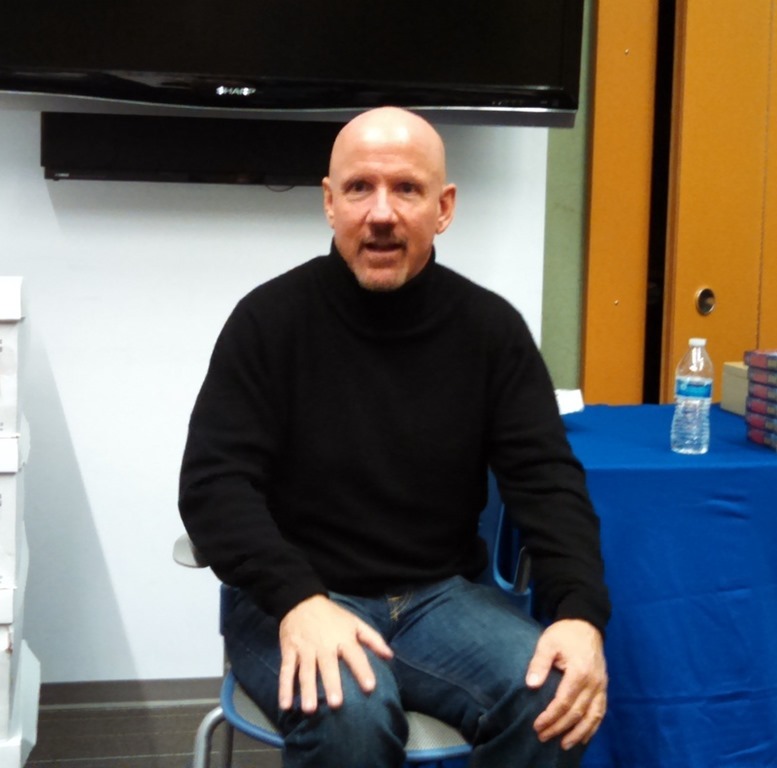 He spoke about his life, how he became a writer, and how he ended up working with James Patterson. The guy from the Poison Pen acted as a moderator and I have to say the whole evening was very well done. We really enjoyed the experience and will do this again. Wednesday- We had our eye appointments at Visionworks, as they are in our insurance plan. We have changed our optical insurance, so we ended up purchasing our frames at half price. Bob bought two pair of glasses and I bought one. Bob uses a different pair of glasses when driving the MH as he does not want the bifocals when driving. I did not like the experience there as much as I did last year. We ran over to Surprise to check out a groomers, as the gal we have been using has decided to stop doing the mobile grooming and she lives to far away to drive the dogs over to her home to have them groomed. We signed up for the end of February to have the dogs next grooming session. We had lunch in, then I went to Mahjongg at 1PM. We had 3 tables going! That is 12 ladies. We are teaching 5 new ladies how to play and they are all doing well. MaryAnne and Ray were going to the Elks Lodge for dinner and dancing, so wel decided to go with them, as did the rest of our group. The band was good and the food was excellent. Bob and I both had broaster chicken dinners with mash potatoes, gravy, green beans and salad for a total of $13.95. The Lodge was packed with people! We did not stay to dance, but returned home and settled in to watch TV and read. Thursday- I had my manicure scheduled and Bob needed a haircut. Since both the Barber Shop and the nail salon are next to the park, I drove us over and Bob walked back to the park. I went to the Chiropractor, then I went back to Kohl’s for another item using my Kohl’s cash. Today I tried to use Kohl’s card and it would not work again. So I ended up using the their courtesy phone. After a run through several departments in their corporate office, I got the same answer. “You refused to give us your address,” then they read back my correct address. I explain again about our lifestyle. They just don’t get it. Last November I spoke with them and was told that the situation was all taken care of, and they sent me a new card. Then they closed the account, without notifying me, and wrote down, again that I refused to give them my address. Oh well! I just want the card for the discounts. I pay it off as soon as I buy something. Anyway, I also stopped at Ulta for some primer, then on to Jimmy Johns to pick up lunch, then off to the library to pick up a book which had come in. We ate lunch, and Bob worked on putting more coats on the cabinet doors. I took a quick nap in the recliner. At 4PM we went to the Residents meeting. There are about 280 members who have joined the Resident’s Association. A lot of them were there because there has been a lot of theft in the park. The answer to that was to lock up everything. Huh? There have been four major incidents since Christmas. Two involving theft of golf carts. One incident involved a break-in of a Park Model home with a stolen car. They suggest that everything be locked up. We are already doing that. The owners pay over $5k a year, and they can’t get two guards on at night? A lot of unhappy folks. We returned home and MaryAnne and Ray picked us up to to drive to Red Robin for dinner. Our group has now grown to 10 people, with us adding Judy and Fred, also Alfa owners. We had a nice dinner, but Red Robin is pretty loud. The waiter was really working for a tip, because he brought us five free dishes of sweet potato fries with various dips. They were really good. As usual we had a great time with our Alfa friends. Friday- We worked around the MH in the morning. I would like to get the taxes started but we only have my W-2 and none of the other paperwork. At 11:35 I picked up Paula and then MaryAnne. We headed over to Mimi’s for lunch, meeting up with Linda and Judy. We had a nice lunch, but the waiter did not bring us the usual bread basket, even though we asked him for it. Hmmm, we decided that maybe they are no longer giving the baskets out? We had one in December when we ate dinner with friends in Scotsdale. Since this is our vacation, we went out to dinner, again! We tried to go to Texas Roadhouse, just the two of us, but it was a 45 minute wait. So we went to Black Angus. We had a nice steak dinner. Then we stopped at Mimi’s. When I had paid at lunch, I had received an offer to complete a survey and they would give you either two chocolate croissants or two muffins for completing the survey. I had done this earlier. I also had discovered that we were supposed to have been given the bread basket, so I let them know we had not received one.We are going to have a nice breakfast in the morning with chocolate croissants!